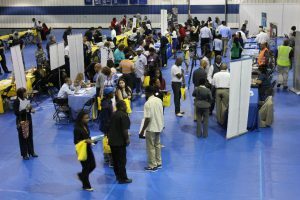 SOUTH HOLLAND, IL– South Suburban College and Thornton Township are partnering to offer a 2018 Community Job Fair on Tuesday, May 22 from 10:00 a.m. – 2:00 p.m. This free event is open to the public and will be held in the South Suburban College Fitness Center at 15800 South State Street, South Holland, Illinois. SSC and Thornton Township invite all job seekers to participate at this special event. For your convenience, free resume writing assistance will also be offered. The Community Job Fair is an excellent opportunity for employers to recruit upcoming SSC graduates and alumni, current students, and community residents. For more information please call Diamond Wright at (708) 210-5748 or email: dwright@ssc.edu. Para Información En Español Llame: (708) 210-5740.